2019 Kawasaki Ninja ZX-10R SE. Picture credits - Kawasaki. Submit more pictures. Complementing the original Ninja ZX-10R and track-focused Ninja ZX-10RR, the Ninja ZX-10R SE features Kawasaki�s highly advanced electronic suspension. Both on the street and on the track, the suspension�s superb damping character offers a level of ride comfort that almost makes you forget you are riding a machine with race-ready suspension, while outstanding damping responsiveness delivers a planted feel that translates to rider confidence and further advances the ease of riding offered by the Ninja ZX-10R. For 2019 the Ninja ZX-10R SE also benefits from the ZX-10R engine upgrades and delivers 203 PS. 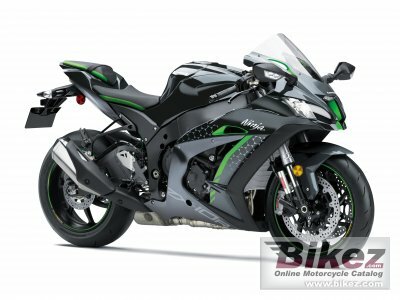 Ask questions Join the 19 Kawasaki Ninja ZX-10R SE discussion group or the general Kawasaki discussion group. Enter your e-mail to join the 2019 Kawasaki Ninja ZX-10R SE forum and get notification of answers and new messages about this bike. You can unsubscribe with a single click. Bikez does not display, sell	or misuse e-mail addresses. Get a list of related motorbikes before you buy this Kawasaki. Inspect technical data. Look at photos. Read the riders' comments at the bike's discussion group. And check out the bike's reliability, repair costs, etc. Show any 2019 Kawasaki Ninja ZX-10R SE for sale on our Bikez.biz Motorcycle Classifieds. You can also sign up for e-mail notification when such bikes are advertised in the future. And advertise your old MC for sale. Our efficient ads are free. You are also welcome to read and submit motorcycle reviews.